The addition of some vibrant red Canna Lilies in my backyard garden this year has had just the result I’d hoped for. 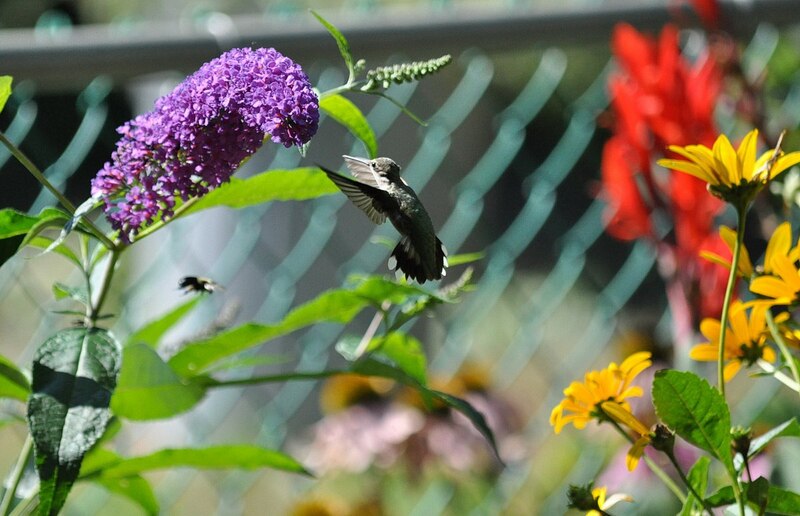 Every day, for several weeks in August and early September, I had a Ruby-throated Hummingbird visit my flowers on its trek south. 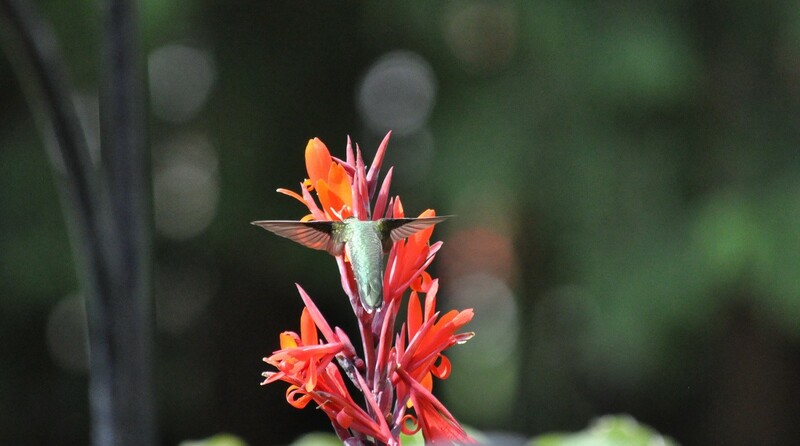 My girlfriend who supplied the healthy roots of the Canna Lilies said that the red blossoms with their tubular growth habit were a magnet for hummingbirds, and she was absolutely right. Canna Lily blossoms are unusual in that the predominant parts of each flower are over-sized stamens that protrude from 3 long sepals behind which are 3 insignificant red petals. 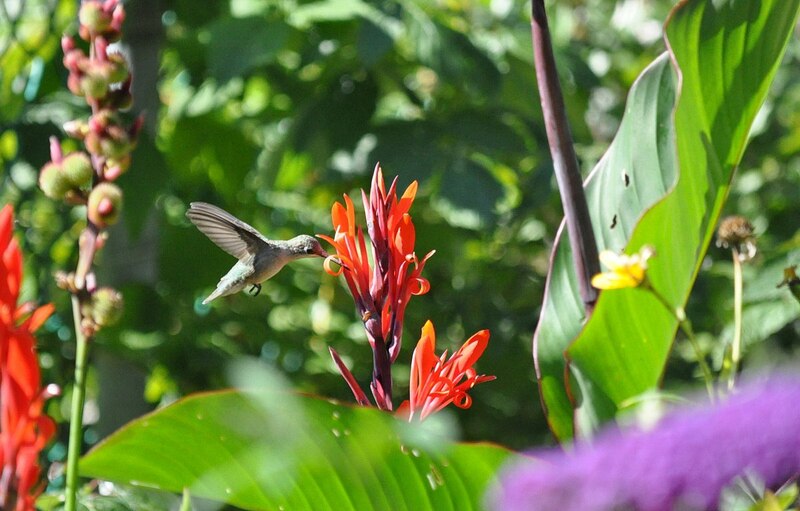 The actual petals are seldom noticed, but the combined effect is that of tempting tubular flowers that the Ruby-throated Hummingbirds cannot resist. Held aloft on tall, sturdy stalks, these flowers standout when a lot of other bloomers are on their way out. 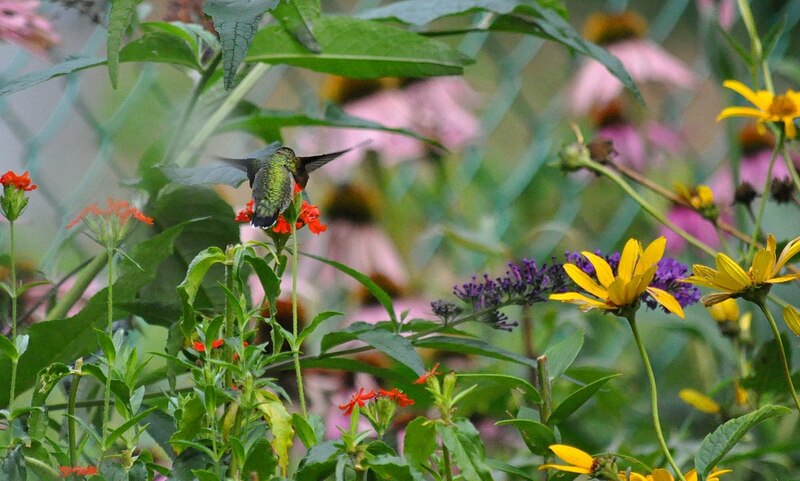 That’s not to say that other blooming plants in my garden were ignored by the visiting hummers. 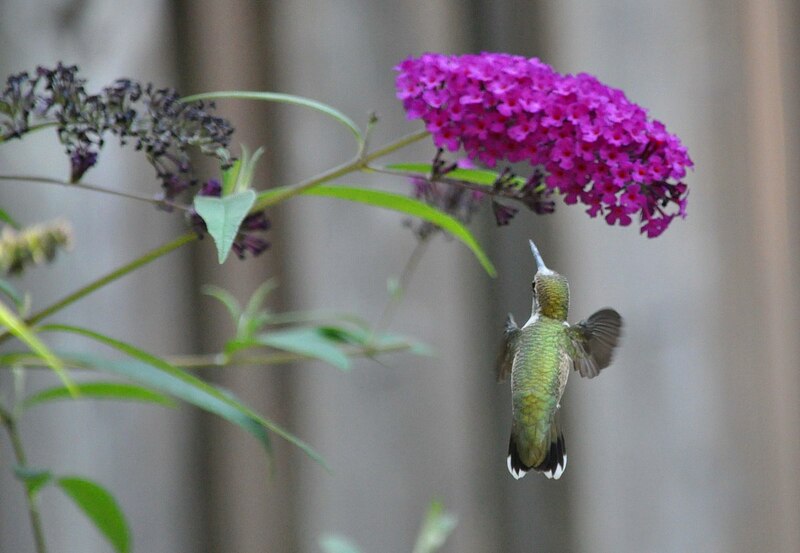 The Buddleia bushes with their composite flowerheads of tiny tubular flowers were visited on the Hummingbirds’ tours around my yard, and even the yellow False Sunflowers on occasion were probed by the long slender bills of the Ruby-throated Hummingbirds. I even surprised myself this summer. It was actually a bit late in the season when I finally remembered to deadhead the Maltese Cross plants, so I really didn’t expect them to give me a second set of flowers. 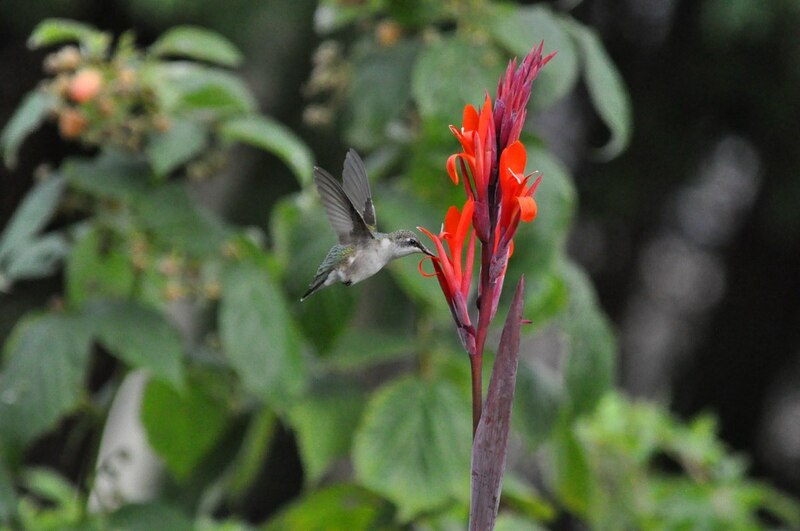 A few weeks later, however, they generated a fairly unsubstantial showing of blooms, but that extra hit of red colour in my garden pleased the Ruby-throated Hummingbirds that took time to sample their nectar as well. 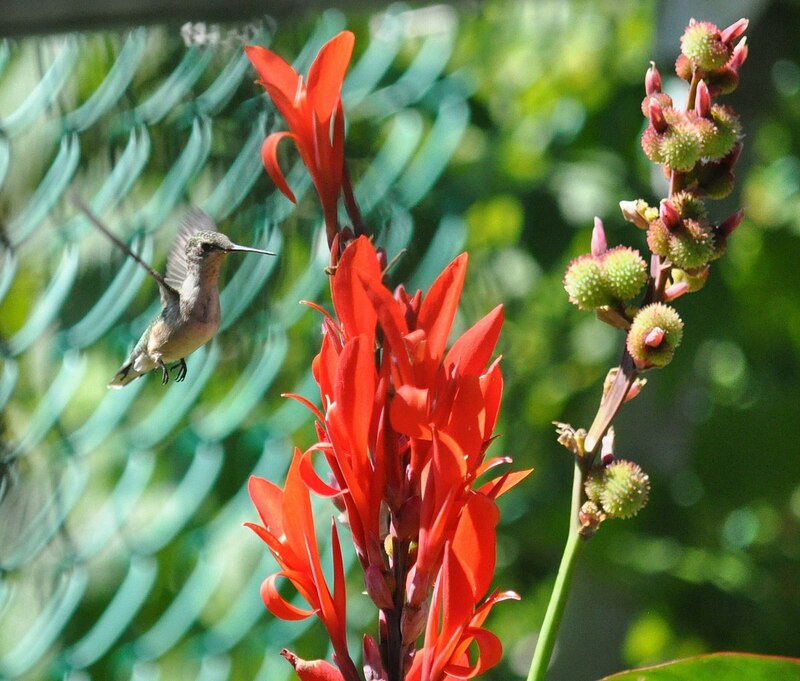 I had a lot of fun waiting and watching for the hummingbirds to appear each day, morning, noon and night as we ate our respective meals, they would appear to take their fill as they build their energy stores for the long flight south. 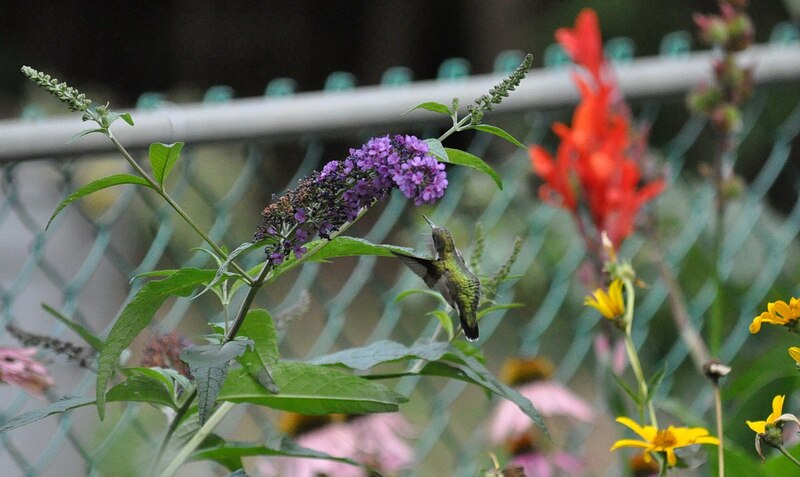 I was hoping that a male Ruby-throated Hummingbird would grace my garden, but unless we missed it, only females found my flowers worth a stop. You can tell by the white tips on the black tails of the females. 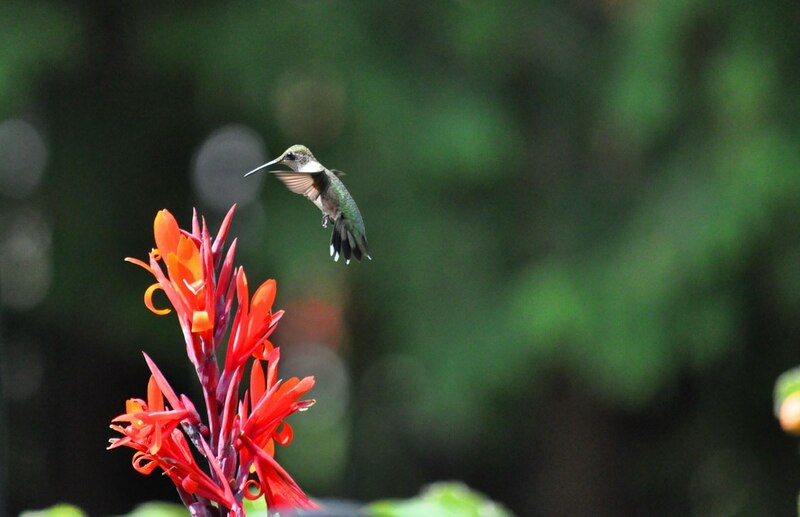 As bird photography goes, the Ruby-throated Hummingbirds gave me a real challenge. Given the rate at which they flap their delicate wings, it is hard to freeze frame the movement, but I was thrilled with my results. Most often, Bob and I would be in the house when the Ruby-throated Hummingbirds crossed into our backyard, so we had to have a keen eye when glancing out the windows to spot their tiny bodies where they glittered in amongst the leaves that were larger than the birds themselves. I tried on numerous occasions to creep closer to the garden in the hopes of better photographs, but always they would veer away and alight high on the branch of the White Birch Tree. In fact, they seemed to delight in perching there where a section of bare branch allowed them to rest and soak up the sun at the same time. Unless you saw them land, they were almost invisible to the eye. Soon, they will be winging their way towards Central America, but for now, we enjoy observing the frenetic movements of these fast-moving flying gems.